CAIRO – Amid growing concerns about violence in Egypt, influential Muslim scholar Sheikh Yusuf al-Qaradawi has issued a fatwa condemning the army’s removal of Egypt’s elected President Mohamed Morsi and calling on Egyptians to support the Islamist leader. “Their every action is invalid,” Qaradawi said in a fatwa posted on his website and cited by Agence France-Presse (AFP). He urged “all parties and political groups in Egypt to support correctness and restore President Morsi to his legitimate post”. 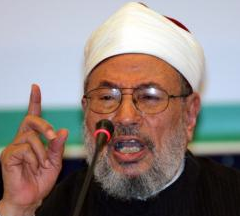 Sheikh Qaradawi decried the military move to oust President Morsi as un-Islamic. “Shari`ah (Islamic law) imposes on all believers allegiance to the elected president, to carry out his orders and conform to his directives,” Qaradawi, the president of the International Union for Muslim Scholars (IUMS), said. Morsi “must remain president, and nobody can claim the right to remove him in the name of the people”, Qaradawi added. The influential scholar urged all Egyptians to protect their January 25 revolution. “I call on all Egyptians, men and women, young and old, rich and poor, Muslim and Christian, liberal and Islamist to join ranks to protect the gains of the revolution” that overthrew Hosni Mubarak in 2011. Qaradawi, 86, is regular commentator on Al-Jazeera satellite television and has backed the Arab Spring uprisings in Tunisia, Egypt, Libya, and Syria. Last week a post reported that f Qaradawi had urged Egyptians to engage in dialog to reach a solution and that according to the tenets of Islam, “we are ordered to obey him [Morsi] so that chaos does not prevail.